The High Rainfall Zone in southeastern Australia has high yield potentials for wheat and canola, but growers are faced with challenges about resource allocation in a relatively new and rapidly evolving cropping system. This project will develop tools that predict the production and economic response as well as the risks associated with applying the level of inputs needed for wheat and canola crops to achieve their potential in this region. Cropping systems have been moving from the low and medium rainfall areas of Australia into the higher rainfall zones, typically those with average annual rainfall of more than 550 mm. The achievable yield potentials in these regions are high (around 8 t/ha for wheat and 5 t/ha for canola), but crop management and cultivar availability is limiting the achievement of those potentials. Canola and wheat grain yields in the high rainfall zone of southern Australia are currently less than half of the predicted potential. The main barrier to achieving these potential yields is the application of sufficient nutrients. There has been limited research on nutrient response of crops to soil nutrient status, conducted in this humid region. In the southern cropping regions of Australia, grain yield potentials are high due to relatively high rainfall and long growing seasons. However, current management practices including variety selection, sowing times and nutrient management are all derived from areas of lower yield potential. This research is part of an integrated project to move paddock yields closer to their potentials by identifying the impacts of improved practices. 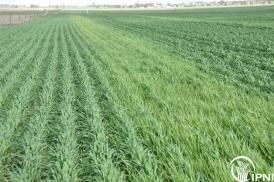 The first output from this Grains Research Development Corporation (GRDC) funded research project was a summary document of the current status of cropping in the high rainfall zone (HRZ). The situation analysis of the soil nutrient status across the HRZ of southern Australia indicated a range of varying nutrient deficiencies in different regions.